Home Crepe Blog “Fall” Right into Seasonal Fruit & Colours! “Fall” Right into Seasonal Fruit & Colours! Ah, September… it’s time to wind down the pool parties and golf games, and settle into the month of changing leaves and fall fairs. And for many children and parents alike, the fading memories of summer turn into binder-buying and clothes-shopping for ‘back to school’! That said, thank goodness we start the month off with the extra-long Labour Day weekend. This year, we have made a valiant attempt to ease you out of summer fun and into the fall season by developing a fancy new crepe that tastes great and actually reflects the colours of the season! Ever since the 1880s, Labour Day in Canada has been held on the first Monday in the month of September – this year it falls on September 3rd. Viewed as the unofficial end of summer, it gives everyone a chance to spend some time with family and enjoy the great outdoors before it gets nippy! The shift into the fall in Canada signals a whole new set of activities – the most popular one probably being “leaf peeping”, or checking out the changing colours of the trees! If you’re not into leaf peepshows, you could also try out some fall fishing or apple and berry-picking, or check out the livestock and autumn harvests at the local fall fairs! And cap it all off with some traditional Labour Day fireworks. This month, our feature is a healthy number complete with autumn colours and seasonal fruit! 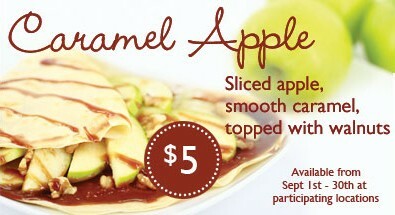 Dubbed the Caramel Apple, this scrumptious crepe is stuffed with sliced apples and smooth caramel sauce, and topped with walnuts. Just the thing to help you “fall” right into the new season!